A zener diode can be used as a voltage regulator or voltage stabilizer, to provide a constant voltage from a source whose voltage may vary over a particular range. The circuit connection is shown in Fig.1 . 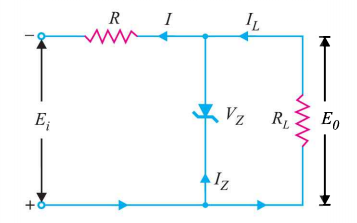 The zener diode of zener voltage VZ is connected reversely across the load resistance RL across which constant output voltage EO is required. The series resistance R is used to absorb the output voltage fluctuations, so as to maintain constant output voltage across RL . When the circuit is properly designed, the output voltage EO remains constant even though the input voltage Ei and load resistance RL may vary over a wide range. Suppose the input voltage Ei increases, since the zener is in the breakdown region, the zener diode is equivalent to a battery of voltage VZ as shown in Fig.2 and the output voltage remains constant at VZ ( EO =VZ). The excess voltage is dropped across R. This will cause an increase in the value of total current I. The zener will conduct the increase of current in I, while the load current remains constant. Since the zener diode is in breakdown region , voltage across it will remain constant at VZ. As the output voltage EO is equal to the zener voltage, So EO will also remain constant at VZ. When RL decreases ,in order to maintain EO constant, current through the load resistance IL will increase. Since Ei is constant, total current I is also constant. So the increase in load current IL will come from a decrease in zener current IZ .